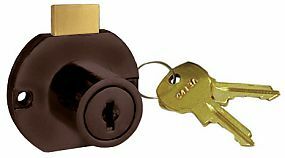 This disc tumbler drawer lock from National Cabinet Locks is for surface mount applications. Application: For Drawers. Surface mounted, requires 7/8in. diameter hole for cylinder. Note: This product is also known as NCL-C8703-4G-KA413A on other websites.